Bodybilt Big and Tall Chairs set the ergonomic standards for big and tall office chair manufacturing. That is why we rely on Bodybilt performance, comfort and durability; and have for 14 years. These ergonomic chairs for the big and tall offer a unique solution to the seating needs and problems facing users weighing over 285 lbs. and/or greater than 6' 3" in height. These chairs feature a steel reinforced seat structure and seating surface that is 22% larger than on Bodybilt's regular executive/management models. This special seat contour helps spread the user's body weight over an increased surface area which is particularly important in larger users. These chairs are warranted for users up to 500 lbs. Bodybilt Big and Tall Chairs match most of the features of our regular task and executive models with the exception of "back angle" adjustment. Automatically comes with a special highly durable seat pan length adjuster (back depth) to accommodate varying leg lengths. 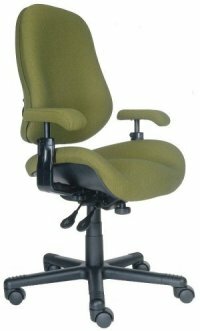 Backrest comes fully upholstered as a standard feature and an optional Air Lumbar® Support is available. Use the following form to begin configuring the Bodybilt Big & Tall chair which best meets your needs. Once you have made the selections below, click the "Continue Configuration" button which will take you to a page where you will select specific upholstery color and other available options. If you are not yet familiar with BodyBilt chair features and options, you will find the "more info" links under each step below helpful while configuring your Bodybilt chair. NOTE: - selection of GRADE 4 Upolstery disallows later selection of the S'Port Ridge option because the S'Port Ridge causes unacceptable wrinkling of the GRADE 4 Uphosltery. PRODUCT INFORMATION DISCLAIMER: www.BackBeNimble.com offers the finest back pain relief products and best solutions to address self care, ergonomic postural support, stress relief, lifestyle improvement and enhanced personal comfort. Such should not be considered medical advice or substitute for recommendations of an attending doctor. Back Be Nimble does not receive funding from any manufacturer or brand; as such are purely mentioned as informational. Contents Funded and Copyright © 1994-2019 by Back Be Nimble -All Rights Reserved. Implementation Copyright © 2019 by hav.Software - All Rights Reserved. RSS - Let's Talk Back Pain Solutions. BodyBilt is a registered trademark of Ergogenesis, Inc. Back Be Nimble is a fully authorized dealer for Ergogenesis, Inc.